The binding of antibodies to target antigens can be visualized by either colorimetric or fluorescent methods. The methods for visualization involve either direct or indirect binding. Primary antibodies can be directly conjugated to fluorophores, enzymes or other substances that will aid in the visualization, such as GFP, biotin or horseradish peroxidase. However, when primary antibodies are directly conjugated, this limits the number of applications that they will be suitable for, as well as the sensitivity. For this reason, most researchers prefer to use conjugated secondary antibodies that will bind to the primary antibody of interest. Secondary antibodies are raised against the same host species that was used to generate the primary antibody. For example, if the primary antibody was raised in rabbit, then an anti-rabbit secondary antibody that was raised in a species other than rabbit should be used. Secondary antibodies that are designed for use in Western blots and ELISA are generally conjugated to enzymes, such horseradish peroxidase or alkaline phosphatase. Biotin-conjugated secondary antibodies are also commonly used. The biotin label is small and stable, so it rarely interferes with the function of the labeled antibody. Biotin binds very strongly to avidin, and the biotin-avidin interaction can be used to further amplify the signal. Streptavidin is purified from the bacterium Streptomyces avidinii, and although this protein does not bind quite as strongly to biotin, it is used in various detection systems because it is unglycosylated and less likely to aggregate. Streptavidin also exhibits lower non-specific binding than avidin. Each avidin or streptavidin will bind four biotins per molecule. When a biotinylated secondary antibody is used for detection, the signal can be significantly amplified by incubation with an avidin-biotin complex or a labeled streptavidin-biotin. Streptavidin can also be conjugated to detection enzymes, such as horseradish peroxidase or alkaline phosphatase, as well as fluorophores, such as GFP and R-Phycoerythrin. 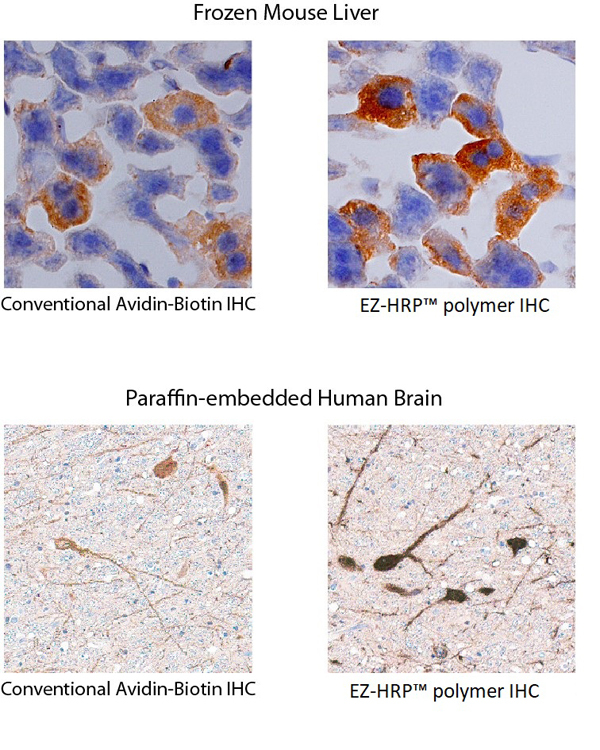 While secondary antibodies can be valuable tools for amplifying signals in immunohistochemistry, additional steps are often required to prevent non-specific binding, which can make it difficult to visualize the exact location of the protein of interest. The causes of non-specific binding include interactions between the primary and/or secondary antibody and serum proteins, ionic interactions between antibodies and tissues, as well as interactions with endogenous molecules that may interfere with the detection system used. Non-specific hydrophobic interactions can be at least partially prevented by incubating tissue sections with heat-inactivated normal serum or bovine serum albumin. However, it is important to choose a normal serum that will not interact with the primary or secondary antibodies. The best choice is generally a serum from the same host animal as the secondary antibody or a serum from a species that is unrelated to either host species. Ionic interactions can be reduced by increasing the ionic strength of the fixative and diluents. Endogenous enzyme interference can be reduced through the use of blocking reagents, such as hydrogen peroxide (for horseradish peroxidase) and levamisole (for alkaline phosphatase). When avidin-biotin based detection systems are used, interference from endogenous biotin can be reduced by first incubating the sample with avidin to block the biotin binding sites and then incubating the sample with biotin to block any additional biotin binding sites on the avidin molecule.